racefriv.com: All the Formula Drift 2012 News I Could Find! All the Formula Drift 2012 News I Could Find! I've been reading a lot about FD 2012 cars this year, and I can't wait to see what happens! Click more to see about every link to everything I can find!! I think one of the biggest stories to come out so far is that Walker Wilkerson is going to be running an LS7 this year. I know all the 4 banger lovers are going to cry a little tear. It is kind of sad so many are running an LS motor now. I know why they do it but lets not make this like Nascar everybody. I guess the next big news is that there is a new entry to FD this year, Daigo Saito's who has been drifting in Japan for quite some time. 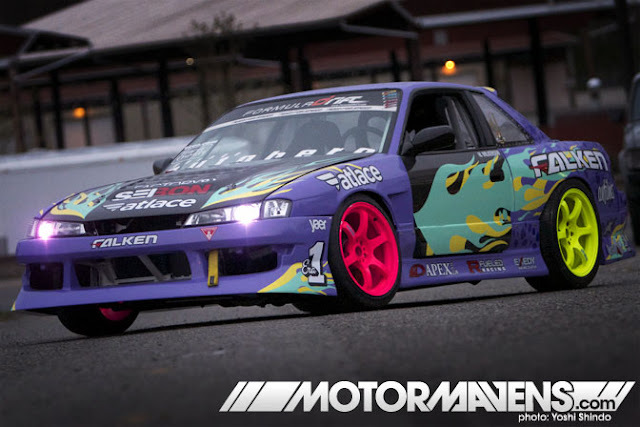 He's one of the few not drifting a V8, hes rocking the 2jz, with around 1000hp!!!!. Ken Gushi is going to be drifing a Scion FR-S this year. I cant wait to see this!!! Taka Aono is going to be piloting the ever familiar AE86 but this time with a little change on the norm. Not sure yet but I'm pretty sure hes not going to run a 4AGE. (this is his old car, he now runs for MEGAN and its purple) some one find me some news on his new car. Matt Powers has a kinda new look and is building a new S14 for this year. Dude has been running the same chassis for like 5 years. Wow. Looks like Samuel Hubinette is not going to do a full schedule this year, the old school guys seem to be moving on. Ross Pettys car is seriously sponsored by Ron Paul. Really. Forsberg is same old, same old. Look like Kyle Mohan is still rocking the RX-8 with a refresh, still rocking the rotary as well. Fredric Asbo could be using his Supra this year!!! I really hope so, that's where he belongs, not in a TC. Somebody send FD a picture of Chris Ward. Last years champ, its going to keep the good times rolling with basically what he ran last year. OK I think I'm done now, I think Walker and Matt are going to make for some really fun times. You can't ever forget about Chris and Von they're both awesome. Dai has it dialed in, but people like Daigo and Darren cant really throw him off. Daigo even though winning the D1GP, is going to have a really hard time getting used to all those Ls's out there, they are going to pull on him like crazy when hes waiting for that 1000hp to spool. This year is going to be awesome, its anybodies game. I'm Super excited!!!!!! !